Lord Thomas Hawksby Lord of the Hawksby estates in North Yorkshire Lord Thomas is the eldest son of Lord Grantham Hawksby and his wife the honorable Lady Elizabeth Howell. Hawksby has two brothers and a sister, James, Matthew and Jayne. Hawksby spent many years on the continent fighting in the religious wars in Germany and fought under Gustavus Adolphus at the battle of Lutzen. He returned to England when his father was taken ill. Following his fathers death shortly afterwards Hawksby too over the running of the family estates, including the local militia. On the outbreak of hostilities with the king Hawksby rallied to the cause of Parliament, believing that the King has been misled by wicked advisors and has overstepped the bounds of his right authority. Like many of his contemporaries Hawksby hopes the war will remove these evil men and bring the King to his senses. 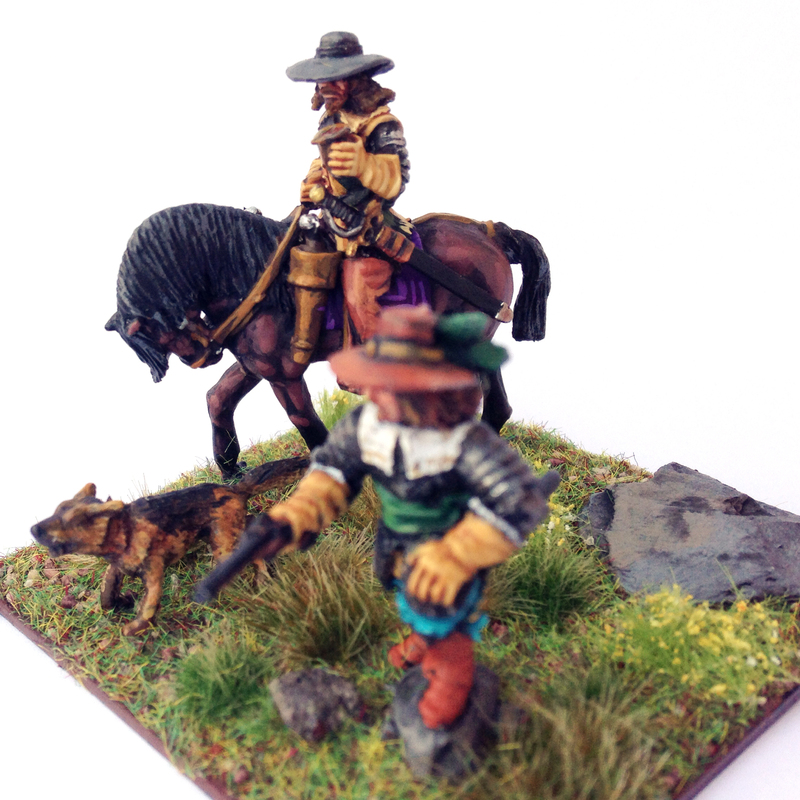 Thomas is seen here with his loyal Dog Darby and his Squire Martin Bracken. Both figures are from the Warlord Games Pike and Shotte range. The dog, Darby, is a Crooked Dice Guard dog. 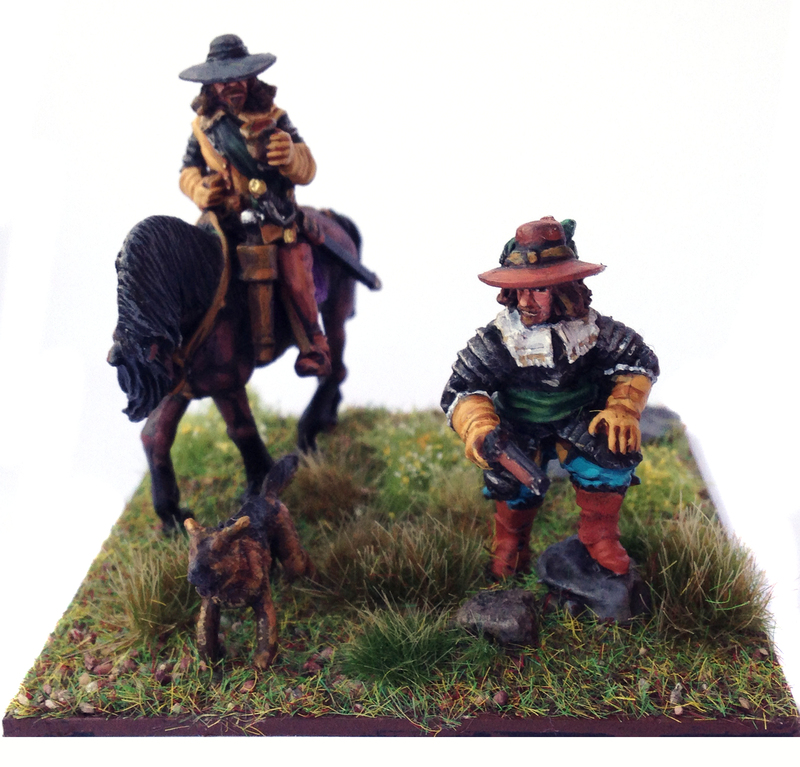 Posted in Characters, Miniatures and tagged 1643, 1644, 1645, 28mm, Coat, Colours, ECW, English Civil War, graphic novel, Musketeer, Perry Miniatures, Pike and Shotte, Thirty Years War, Warlord Games, Witchfinder General. Bookmark the permalink.